I love my veggies, but cauliflower has always been one that I avoided. That is, until I made this Coconut Curry Cauliflower! Coconut and curry were made for each other and the flavors go so well in this easy side dish. If you wanted to make this a complete meal, you could serve it over rice or quinoa. I also think the additions of some greens, like spinach, would be delicious. I used the full fat canned coconut cream to make this dish extra rich in flavor and texture. 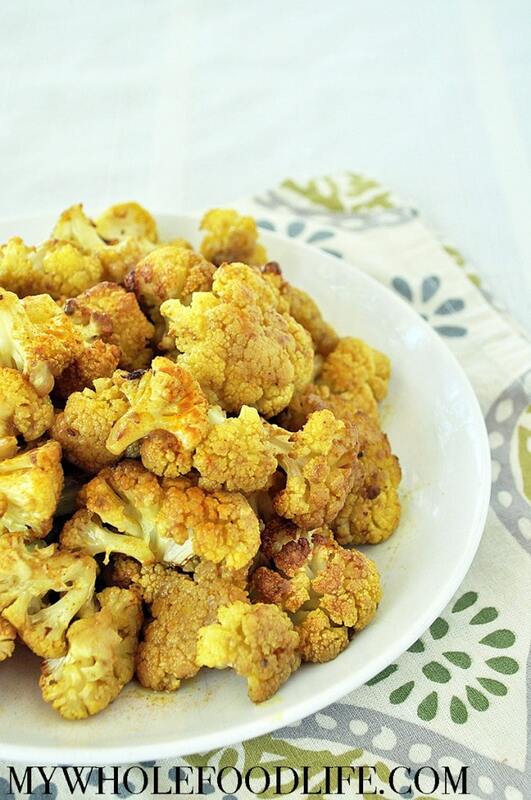 This coconut curry cauliflower is super easy and only contains a small amount of ingredients. It’s vegan, gluten free and paleo approved. I hope you love it as much as we did. The perfect side dish. Just add your favorite protein and serve! 1 head cauliflower, cut into florets. If you are using the full fat canned coconut milk, open it and scoop out the fatty white part. Add it to a large bowl. You can save the remaining water to add to smoothies. Mix the florets with the rest of the ingredients. Stir everything until it's coated well. Transfer to a medium sized casserole dish . Bake for about 45 minutes, stopping every 15 minutes to toss the cauliflower around. This should last about 4-5 days in the fridge. I am sure it could be frozen as well, but I have not tried that. Enjoy! My feelings on cauliflower exactly! I keep thinking about wrestlers when I eat it. That comment will bypass those who have no knowledge of the sport. Can't wait to try it. Still not my fav veggie, but enjoyed the masking curry flavor. Thank you for the creative ideas. I LOVE CAULIFLOWER!!! Im a bit worried that if I made this Id eat it all in one go!